Despite being a self-confessed travel lover, I hadn't ever been to Kerala, if you don't count the trip I did when I was only a couple of years old. So, when my brother Karan (who was coming for a month-long holiday to India from the US) suggested that we go to Kerala for a few days, I was excited. Finally I would get to visit God's own country! We landed in Kochi airport and after lunch at a hotel close to the airport, we headed towards Alappuzha or Alleppey as it is commonly called. 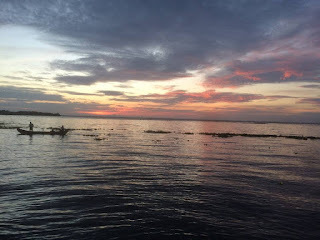 We checked into the Lemon Tree Hotel by Vembanad Lake. We got rooms right next to an infinity pool that overlooked the lake. The view was truly heavenly. The next three early mornings were spent sipping tea sitting on the banks of the lake and enjoying nature at its best - birds fluttering, chirping and the gentle morning breeze causing the leaves on the countless trees around to wake up. 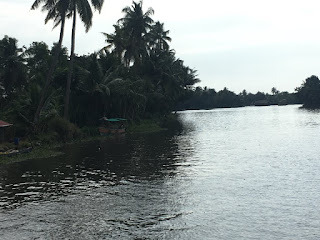 We decided to take a houseboat on our last day in Alleppey and hired one from the Lemon Tree Hotel itself. The 5 hour trip on the houseboat through the backwaters was one of the high points of our trip. The houseboat is well-equipped with two bedrooms, a dining area and an open-to-air jacuzzi. Meals are cooked on the boat to your liking. The houseboat makes its way through the lake into the backwaters and then takes you around in the network of waterways that make up the backwaters. The narrow waterways flanked on both sides by palm trees make for a beautiful sight. We spent a couple of hours in the open top jacuzzi while the boat was going through the backwaters. As we were about to get out, it started raining. This was really an awesome experience. 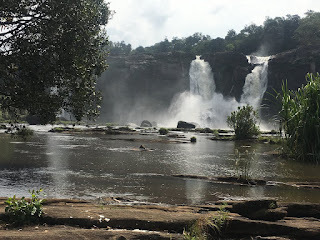 On the penultimate day of our trip, we headed out to Athirapally Waterfalls. This was the same waterfall where movies like Raavan and Bahubali have been shot. The waterfalls are in their full glory during June and July. At this time of the year, the flow of the water was about 25% of what it is then. 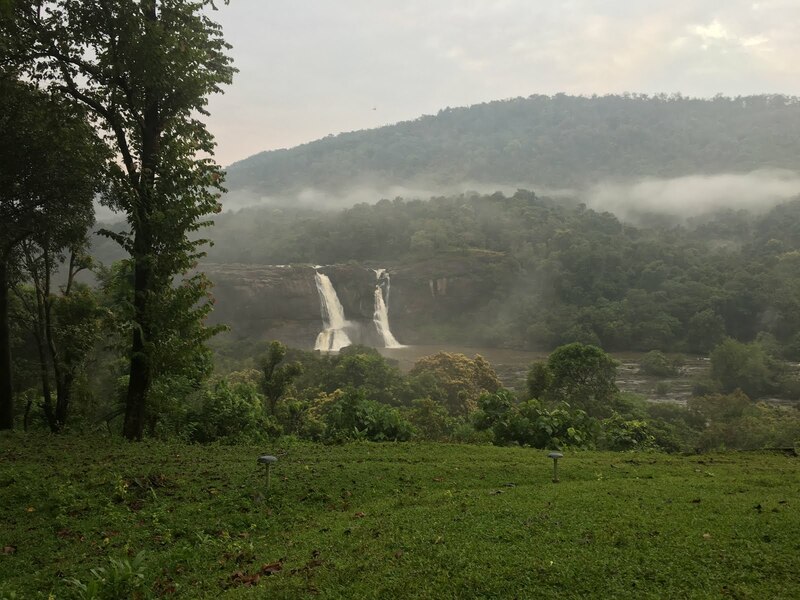 We were staying at the Rainforest Resort which offers a spectacular view of the falls. All the rooms are facing the waterfall and you can see the waterfall while you are showering as well! The next morning, we hiked down to the base of the fall with the help of a guide. I was wary of doing this given my recent heart condition but then I threw caution to the winds and decided to go for it as the thought of getting wet under the gushing water was too tempting to resist. The guide was an expert who knew exactly what he was doing and led us to the base. No one is allowed to go right up to the base of the falls as the water can sweep you away. But he led us to one of the streams of the river that has many mini-waterfalls where you can sit and enjoy the force of water on your head and back. This was easily the best part of my trip. 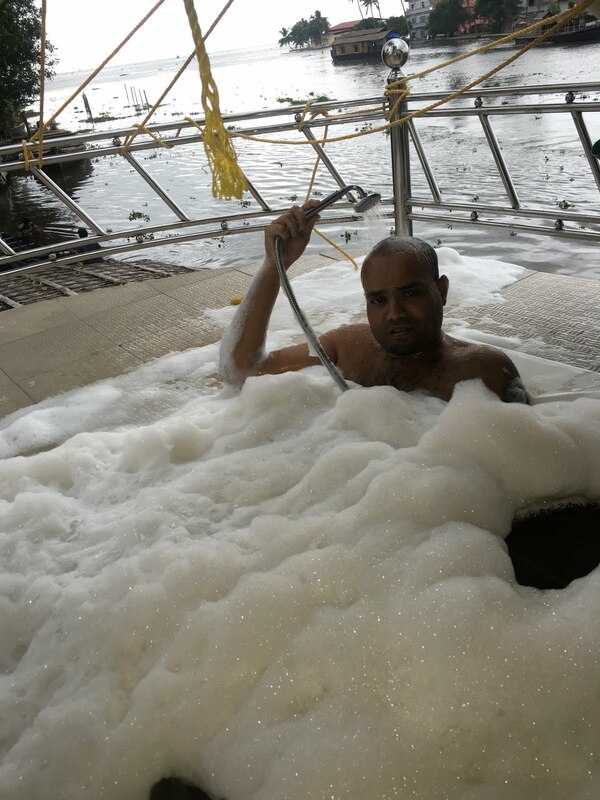 From afar, you feel that the water would hardly have any pressure but when you actually sit under it, you cannot sit for more than a minute at a time. 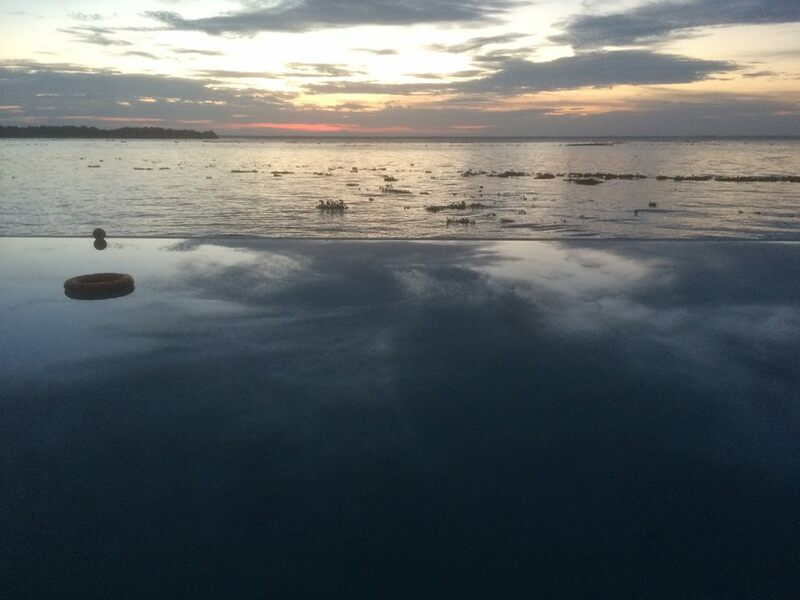 After returning to our hotel, we got into the infinity pool here and relaxed for an hour. 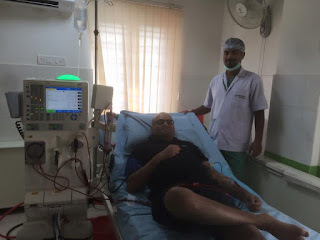 I needed two dialysis sessions during the trip, both of which I took at the NephroPlus centre in Alleppey. I could sleep through most of both the sessions and everything went very well. Gijo and Reneesh there took very good care of me. I generally judge the quality of dialysis by how I feel after the session. At the end of both the sessions, I felt totally fine and rearing to go! On the way from Alleppey to Athirapally, we stopped at an elephant camp where we are allowed to sit atop an elephant and the elephant takes water in its trunk and gives you a shower! 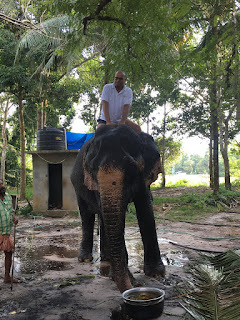 For some reason, the elephant was not in the mood when I was sitting on top of it but began the shower when I was patting it after getting down! Our best culinary experience during our trip was at a very simple, homestay place called Hot Dishes. The food there is prepared only after you arrive. We had a simple 'Kerala Sadhya' or a meal which consists of rice, avvial, sambar, rasam, pickle, curd and papads. They added dosas on special request and the meal was very good. It is prepared and served by the owners themselves. The place is open generally only for breakfast and dinner but I called them around lunch time and requested them to serve lunch and they agreed! Traditional Kerala hospitality, for you! After your loving Pat..elephant shower!